Dog obedience must be the most attended of all dog training classes. Even if an owner never intends to compete in a canine event, they want their new family pet to be able to understand simple commands and not to be a liability around the home. When out walking with the family, a dog must be able to walk to heel on a lead and understand commands if the chance arises to run off lead. It should always be remembered that a dog must be under control at all times and if by chance a dog causes an incident while off lead the owner can now be charged severely by the police and local authorities. It may be that you are introduced to the sport of obedience while taking your puppy to a socialising class. It is advisable to start training a dog as soon as possible for obedience work; however, a well behaved dog can join this sport at any age. Like agility it can be enjoyed as a hobby or undertaken as serious competitive sport. Just as there are different classes for the show world there are also different levels to work through in obedience. 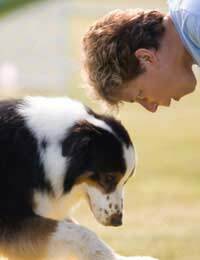 Dogs can become obedience champions as well as show champions. There are many obedience clubs throughout the country and to be able to organise an obedience event the club or society must be licensed with the Kennel Club. A dog that competes in obedience does not have to be a pure bred dog that is KC registered. Contact the Kennel club for a list of obedience societies. It may be at your dog training club that you first compete against other dogs. It may be a fun thing to do but then you get the ‘bug.’ Companion shows and inter club matches may come next, where you can see how your dog works in a strange environment called the ‘ring.’ If your dog enjoys his outings you will next move on to Open shows and then Championship. Entries are made for obedience shows very much the same as the breed shows. A schedule is obtained and an entry form sent in before the closing date. Classes are different but like the beauty aspect, are still graded as to the dog’s ability and wins.With classes like; pre-beginner, beginner, novice, A, B, C and also Championship C it can be daunting for a novice, but the schedule will explain each class. If you are still in doubt, speak to the trainer at your club and she will advise on the best class to enter. You will have to win a certain number of times in a class before you can move up to a higher class. Each class has a set test for the dog and handler to perform with the tests becoming progressively harder as the dog moves up in class levels. The type of tests a dog will have to complete include, heel on lead and off lead, recall and stays. The stay is done as part of a group. There will be a judge and a steward in the ring while the tests are done. The dog is marked according to its aptitude on each command. All dogs in each class are marked to the same point system. You can see from this brief description that a dog can benefit from basic obedience skills as this training can be put to use in its daily life. Obedience competition is supported at Crufts with the crowds always strong in the exhibition rings watching the large group stays and the intricate heelwork. The dogs are devoted to their owners and seem to delight it pleasing them and the crowd who cheer after each dogs completes its test. All dogs competing at Crufts are obedience champions.